Stress not only contributes to violence and behavior issues, it impacts focus and memory, fundamentally impairing a child’s ability to learn and make good decisions. My 40 years as an educator have led me to an impor­tant insight: stress is crip­pling our schools. The students at San Francisco’s Visitacion Val­ley Middle School, where I was principal for the past 12 years, face drugs, gangs and violence every day. Most of the students in our school have a family member who has been shot, who did the shooting, or who saw a shooting. The majority are on free or reduced-price lunch. Many have little or no parental support. On top of these extreme conditions, there is the pressure to achieve and succeed in a fast-paced, chaotic world. All of these circumstances together compromise the physical health, and in turn the cognitive and psychological capacity, of our students. This pervasive stress also compromises our teachers’ ability to teach effectively and sur­vive in the teaching profession. As a result schools like ours have many problems: low attendance, violence, low performance, and high teacher turnover. This pattern in low SES communities is so common it is almost an assumed outcome – the predictive power of demographics. In our case, students reside in zip codes 94124 and 94134. Based on these zip codes, our students’ ethnicity, and the fact that few of their parents attended college, educational researchers feel they can predict our stu­dents’ attendance rate, behavior, test scores, and overall academic achievement. In the first eight years of my tenure as principal we introduced many new initia­tives, engaging community organizations offering afterschool tutoring, sports, music, peer support and counseling services in an attempt to improve the school conditions. There was improvement, but at the end of 2006 there was still a lot of stress and vio­lence. Even though we established clear be­havior goals for all students and common standards for all teachers to uphold, high tension and turmoil remained, impairing the learning experience. Fighting was prev­alent in our school throughout the day, so much so that we were known as the “fight school” in the district. Fear, sadness and tension dominated the school climate. At this point we looked for options that would directly address stress. We came across a program known as Quiet Time, an innovative, high impact stress reduction and readiness-to-learn initiative that integrates medi­tation (yes, meditation, not media­tion – we already had that) into the daily routine of the school. Quiet Time was developed by Washington, D.C. Principal George Rutherford at the Fletcher Johnson School in the early 1990s. I spoke to Rutherford, who told me that after he implemented Quiet Time, the fighting at his school diminished significantly and his students started learning more. So I invited the Cen­ter for Wellness and Achievement in Education, a local non-profit that teaches meditation to students, to help us develop and implement the Quiet Time pro­gram at our school. Our teachers voted to adopt the program, with 95 percent in favor. We applied for funding from the David Lynch Foundation and launched the pro­gram in January of 2007. For QT (Quiet Time) we created two mini class periods of 15 minutes, one in the morning and one in the afternoon. We used our homeroom class period and a few minutes from lunch and our passing peri­ods to create these two class periods. In QT, our students get a break from all of the pres­sured activity in their lives – 15 minutes of total peace and decompression. Every morning after the teachers take role, an announcement goes out to every classroom: “Teachers and students, please prepare for Quiet Time.” Then teachers have students clear their desks, face front and a quiet bell is rung. The students close their eyes and for the next 15 minutes, an effulgent peace engulfs the school. No noise anywhere – safe, quiet, peace. Afterwards, the students move into their academic classes more settled, clear and ready to learn. 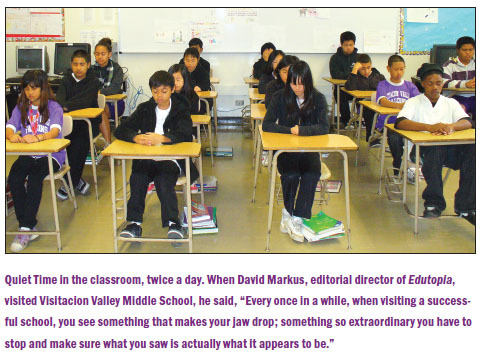 All students and teachers are offered training in an evidence-based meditation technique called Transcendental Medita­tion. This meditation was selected because comparative research indicated it is particu­larly effective at reducing stress and sup­porting healthy brain development. In QT the students either meditate, or sit quietly and rest. The teachers watch over the students and maintain a safe environment. The teachers themselves meditate before school, during their prep periods, or after school. When we first started QT, we imple­mented the program in sixth and seventh grades, with the eighth grade as a control group. Over the next four months we ob­served remarkable changes. The first thing we noticed is that the sixth and seventh grade referrals went down and the eighth grade referrals increased. Similarly, when we looked at suspen­sions, we noticed they were dropping in the sixth and seventh grade and rising in the eighth grade. When we looked at multi-day suspensions, which are associated with more serious, usually fighting-related in­fractions, there was the largest differential. The multi-day suspensions for the QT stu­dents went down 43 percent relative to the non-QT controls. Fighting in PE in the sixth and seventh grade dropped by about 60 per­cent. It stayed the same in the eighth grade. We also observed that during the STAR testing, the sixth and seventh graders were remarkably focused, while the eighth grade was more rowdy, consistent with our nor­mal experience. When we received our test results, we looked at the QT student scores relative to the prior year, compared to the non-QT students. We found that the QT students improved much more in math and language arts than the controls. The biggest gains were in the below basic and far below basic groups. This data was the first sign that Quiet Time was helping us overcome the predictive power of zip codes. The other thing I noticed as the end of the school year approached is that our teachers were absent less. Usually anywhere from two to 10 teachers would be absent in spring as the wear-and-tear of the year took its toll on the staff. But I was noticing many days where no teachers were absent. When we looked at the data, we found that teacher absenteeism due to illness went down 30 percent over the prior year. In year-end school surveys our teachers cited Quiet Time as the most impactful pro­gram in the school, helping improve school climate, teacher health and student engage­ment. In student surveys, 85 percent of stu­dents reported that QT reduced their stress levels, increased their focus, improved health, and reduced violence in the school. Over the next four years we saw contin­ued impact at our school as a result of the Quiet Time program. Our district intro­duced a report card on number of suspen­sions per student enrolled. Our school went from one of the highest in the whole district in suspensions to the second lowest – a 79 percent reduction. We saw our average daily attendance start trending up after the start of QT, and after four years it reached 98.3 percent. When the district compared the two QT schools to all of the other middle schools, there was a consistent increase in atten­dance in the QT schools, versus no change in other schools. After two years of Quiet Time I started getting hand cramps from signing so many honor roll certificates. A district research department check of our student GPA showed a similar upward trend in GPA. Most encouraging was the fact that the greatest GPA increases were occurring in the lowest-performing demographics, indi­cating closing of the achievement gap. Interestingly, the standardized psycho­logical tests we have administered since the start of QT indicate as our students’ stress levels go down their self esteem goes up. As students become less stressed and more con­fident, we have seen increased engagement as indicated by increased attendance and GPA. Every year at our school we have a huge influx of new students. As much as 70 per­cent of our student body is new every year. This last year there was a particularly large influx as the result of a neighboring school closing. We absorbed many students from the highest suspending school in the dis­trict. At the beginning of the year we saw our behavior problems increase dramati­cally, reminding us how our school was five years ago. But as the year progressed the stu­dents became more and more acclimated, and by the end of the year a high degree of harmony was reestablished. What have we learned? After manag­ing strife and violence year in and year out for several decades of my career, I realized that no matter how much effort we put into teaching, if we don’t effectively address the pervasive underlying tension and trauma experienced by our youth, we can’t make real progress. And the research supports this. Researchers from Columbia University found that the stress experienced in low SES communities is significantly higher than other communities, and this stress impairs healthy brain functioning (National Acad­emy of Sciences, 2009). These brain impair­ments, among other things, compromise a student’s working memory, which in turn compromises the ability to learn. Specifically, working memory is essen­tial to language comprehension, reading and problem solving, and it is a critical pre­requisite for long-term storage of informa­tion. Stress not only contributes to violence and behavior issues, it impacts focus and memory, fundamentally impairing a child’s ability to learn and make good decisions. In summary, the researchers at Columbia found that poverty leads to higher stress, which leads to poorer working memory. Our experience and the research indicates that there is a fundamental need to address the problem of stress in order to overcome the predictive power of poverty and position our students so they can grow and excel. The Quiet Time program has provided this for us. It is by far the most impactful, transformational program that I have seen in my 40 years of education. By reducing the individual and collective stress levels and fostering a positive school climate, it creates a foundation for all of our other school ini­tiatives to be more successful. Students are engaged and learning more. In the past, almost none of our students went to the top high schools (San Francisco has an open enrollment policy for high schools). In the last two years approxi­mately 20 percent of our eighth graders have gone on to Lowell High School, the top high school in San Francisco, and one of the top in the country. Now we use the auditorium almost every day, often with our whole student body. The level of joy and cooperation between our students and our staff is at an all-time high, and our teacher turnover rate has gone down close to zero. Most inspiring for me is that our stu­dents are more happy and positive. My staff and I have enjoyed seeing the friendliness and joy of our students grow. In the last Cal­ifornia Healthy Kids Survey, our students reported the highest happiness levels in San Francisco. You do not expect that from zip codes 94124 and 94134, neighborhoods that experienced 41 murders from 2005 to 2007. The last five years have been the most up­lifting of my career. I have a renewed hope. I have concluded if we truly address the needs of the whole child we can make dramatic leaps forward in our educational success. But we need to think outside the box and address the healthy brain development of our students and staff. On the surface, it appears crazy to some educators that we have two 15-minute peri­ods a day when our students “do nothing.” In reality, they are not doing nothing; they are collecting themselves so that the rest of the day is much more productive. 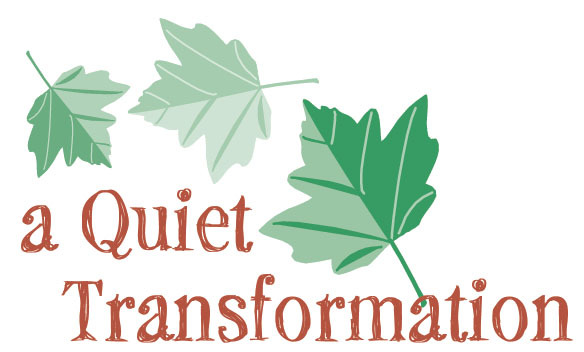 The Quiet Time program is a cutting-edge, 21st century educational initiative I believe can help us realize the goals of mod­ern education: help our students grow into healthy, well educated, well adjusted, happy, contributing members of society. I retire with the lowest blood pressure I have had in 10 years and a great optimism about our ability to realize this vision for education. Journal of Clinical Psychology. (1989). “Dif­ferential effects of relaxation techniques on trait anxiety: A meta-anaylsis.” Ep­pley, Abrams & Shear. Wiley Periodicals. Proceedings of National Academy of Sciences. (2009). “Childhood poverty, chronic stress, and adult working memory.” Evans, G. & Schamberg, M. www.pnas.org_cgi_doi_10.1073_pnas.0811910106. James S. Dierke is retiring principal of Visitacion Valley Middle School. He was NASSP National Middle School Principal of the Year in 2008.